The upshot of the latest risk report is climate change sceptics are becoming increasingly irrelevant. You can choose not to believe the science, but you can’t choose how your customers and investors perceive the world: we are moving to a lower-carbon economy. The world still runs on oil, so it is a slow process, but the trend is clear. Capitalism got us into this mess and with no sign of Utopian revolution on the horizon it looks like capitalism is going to have to get us out. Business recognising that there is money to be made in a shift to a cleaner world is part of that process. Most people, who according to Dann believe the science, will probably find it difficult to believe me when I say that the Royal Society of New Zealand has no idea of the science. Dann says climate change sceptics are becoming increasingly irrelevant, but why won’t the Kiwi Royal Society give them a single reason to believe in dangerous man-made global warming? When Dann describes the move to a “lower-carbon” economy as a shift to a “cleaner” world, he’s telling us that carbon dioxide is filthy. But every chemist and high-school science student knows perfectly well that carbon dioxide is a minor colourless, odourless, non-toxic gas essential to life on earth. It’s as clean as a mountain spring. I hope thousands do this and let me know what the RSNZ say. For years they’ve been encouraging the sort of rubbish reported by Liam Dann, yet when asked point-blank (over several months) how we cause that dangerous warming they had nothing for us. It’s hard to know why, unless they have no evidence. In which case they are beneath despicable. Of course, they will all chorus the reply “the enhanced greenhouse effect mechanism”. But that is mere theory and tells us nothing at all about what has ACTUALLY caused the global warming trend of about 0.9°C/century that has been OBSERVED since the 1950s. 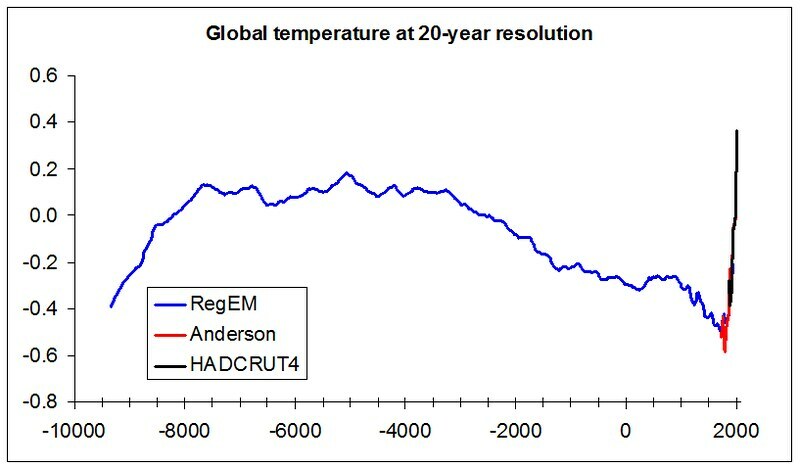 The actual trend does not square with the standard greenhouse theory of ‘Charnley Sensitivity’ being 3.0°C+/century. Everybody knows that the climate models are consistently wrong. The centrepiece of the last two IPCC Reports has been the claim that “more than half” of the observed warming was anthropogenic. But neither report offers anything by way of evidence or authority or even reasoning. The statement is put forward as the “expert judgment” of those people who are involved in operating the CMIP5 suite of climate models. In the world of post-modern science, expert opinion might be all that’s available. Is it better than nothing? Well…here’s where opinions differ hugely. Opinion sure as hell is not science. What the Coalition has been persistently asking for is EVIDENCE. What the NZ Royal Society has made clear is that they don’t have any of that. The Climate Gate scandal has been, and still is, a scam and a fraud-clever political machinations. The lesson is that if it is about politics, finance, economics, science and religious or secular ideology no one is to be trusted unless the facts unequivocally support the assertions. My assertion is supported by the facts. The evidence is clear, and has been from the start. If these scammers and pocket-fillers were right, or believed they were right, they would push for measures which reduce the output of greenhouse gasses and they themselves would lead the way by way of their lifestyle and spending. Sofar,everything the warmistas have suggested and stood for is lies, wrong or irrelevant information, bluff, bluster, bullying, extra spending by the hundreds of billions and telling us furphies. Already they are working on the other scams, for this one will run out of steam sooner or later. Meanwhile, the environment is getting thrashed more and the real problems such as, overpopulation, material waste, inefficiency and prodigiously extravagant living on the part of a very sizeable proportion of humanity, are getting further out of hand. Wastrels are giving capitalism a bad name and they are conspiring to bring back feudalism and worse, but they will go the way of the French aristocracy during the revolution. Live as if there is no tomorrow and there will be no tomorrow! The centrepiece of the last two IPCC Reports has been the claim that “more than half” of the observed warming was anthropogenic. The weakness in the AGW hypothesis is, as far as I can ascertain, that nobody has successfully identified and quantified “natural” warming. That is, warming that has occurred in the absence of any “non-natural” processes. Without such knowledge it is not possible to determine the the effect and the extent of “man-made” processes. Any attempt to quantify the extent of AGW is reliant, therefore, on unsubstantiated assumptions. In other words, guesses! No wonder the climate models have been unable to predict the future with any certainty. I would have been reasonably satisfied with the response of RSNZ had it pointed us to sound evidence that quantified the natural and non-natural warming processes. That it couldn’t is, in my opinion, damning. No, the anthropogenic attribution is almost certainly more than half of the observed warming, i.e. two standard deviations from the mean. The mean anthropogenic contribution is likely more than 100% of the observed warming, i.e. natural variation has had a negative contribution. Let me see if I understand you correctly Simon. You said at the end, “natural variation has had a negative contribution.” Are you stating that if there was no natural variation then the anthropogenic signal would not be held back, and would therefore be even more obvious? Is the natural signal hiding or impeding the human signal? The MSM through prompting by the likes of NIWA are calling this summer the hottest on record ( at mean temperature levels) by something like 0.1C over the previous hottest summer on record, 1934-35. A 0.1C increase in 83 years! Wow. I haven’t seen the numbers yet but I am willing to bet that if we compared the T-Max means for both summers as I have done for Palmerston North, then you will find them tied. If AGW has caused this summer to be so hot what caused the summer of 34-35 to be likewise in a period when according to the IPCC there was no human influence before 1950? If 1934-35 was ALL natural, then why can’t the case still be the same now? Until you answer Gary Kerkin’s basic question you can’t make claims about what proportion of the warming is caused by humans. In the meantime NIWA has conveniently failed to mention the part that La Nina plays in hot New Zealand summers. Go back through a list of our hottest summers and check them against the strength of La Nina events over the past century. Not every La Nina event causes a hot summer or delivers a larger than normal number of ex-Tropical Cyclones and depressions to head our way, but a majority of Las Ninas do. That is natural variation in action. “I have heard that humankind is changing the climate for the worse and that the Society concurs with such hypothesis. Doctor Cleland, can you explain to a simple farmer the exact mechanism by which an increase of CO2 in our atmosphere causes a warming effect? As an emissary of a scientific body, I would expect no less that an exact scientific explanation. Good letter, Mike, well done. Let us know the response. If AGW has caused this summer to be so hot what caused the summer of 34-35 to be likewise in a period when according to the IPCC there was no human influence before 1950? If 1934-35 was ALL natural, then why can’t the case still be the same now? The answer is the trend: this summer was just the hottest of a whole string of summers getting hotter. Stephanie, now it is a ‘trend,’ but in my father’s childhood it was just ‘natural.’ Is that what you are trying to tell me? Sorry but I can’t accept that as an answer when you didn’t answer my first question. The fact that we had a summer over 80 years ago almost identical to this one in mean temperature, shows that the long term trend is very flat if the two summers in question are the peaks! That’s not the answer. You’re saying just because it’s warming it’s caused by mankind. The earth climbed out of numerous ice ages and the Little Ice Age without our emissions. You really must somehow tie some warming to our emissions. Earth was cooling until the Industrial Revolution. Carbon dioxide is the key greenhouse gas; a forcing. Water vapour is a feedback only. In principle it’s very simple physics. The only difficult aspect is trying to understand why anyone would bother denying it. Correlation is not causation and physics is not simple if it concerns the weather, never mind the climate. Political stale air is also a gas. The money is the forcing. If the government money supply dries up, the academics spouting pseudoscience will evaporate and the political stale air will turn to dry ice. Deniers of false theories are not only the proper feedback, but also an effective corrective in the face of concerted corruptive collusion by political operators who refuse to be useful and productive world citizens. Look at the paleoclimatic record. CO2 and surface temperature are well correlated. The current rate of increase in both CO2 and temperature is almost unprecedented. Theory and observation are consistent. CO2 and surface temperature are well correlated. The current rate of increase in both CO2 and temperature is almost unprecedented. You say these things are correlated. Now just describe how it happens. Is your problem that you do not understand how the grenhouse effect works? Because the Earth’s surface is colder than the Sun, it radiates at wavelengths that are much longer than the wavelengths that were absorbed. Most of this thermal radiation is absorbed by the atmosphere and warms it. Joseph Fourier worked this out in 1824. John Tyndall measured the radiative of the important greenhouse gases in 1859. Svante Arrhenius made the first quantitive predictiion of a doubling of CO2 in 1896. I don’t have a problem, I have a question, which you never answer, probably because you cannot answer. Given the facts you mention, which are fascinating, and any others you wish to nominate, please describe how our emissions cause dangerous global warming. Or is it time for you to vanish again? You talk in circles. I have just shown you how our emissions cause global warming. You have now inserted the word dangerous, which is a quantitative judgement, so you now need to refer to the body of work that I presented elsewhere. Where have you just shown me? I must have missed it. I have not “now inserted” the word dangerous. I’ve been using the word for years to describe the warming we’re accused of, since Bob Carter pointed out that if it wasn’t dangerous we wouldn’t need to do anything about it. As for its meaning, that’s just another diversion of yours to distract and delay; you know very well what dangerous means, you’ve read the warmsters wild predictions as well as I have. What more do you need? If you need more help than that, heed my advice and ask the Royal Society or James Renwick. Referring to the body of work you presented elsewhere is a fool’s errand—which means no, thank you.